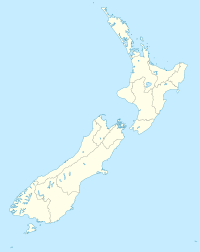 For the electorate, see Tauranga (New Zealand electorate). Tauranga (Māori pronunciation: [ˈtaʉɾaŋa]) is the most populous city in the Bay of Plenty region of the North Island of New Zealand. It was settled by Māori late in the 13th century and by Europeans in the early 19th century and was constituted as a city in 1963. Tauranga City is the centre of the fifth largest urban area in New Zealand, with an urban population of 141,600 (June 2018). The city lies in the north-western corner of the Bay of Plenty, on the south-eastern edge of Tauranga Harbour. The city extends over an area of 168 square kilometres (65 sq mi), and encompasses the communities of Bethlehem, on the south-western outskirts of the city; Greerton, on the southern outskirts of the city; Matua, west of the central city overlooking Tauranga Harbour; Maungatapu; Mount Maunganui, located north of the central city across the harbour facing the Bay of Plenty; Otumoetai; Papamoa, Tauranga's largest suburb, located on the Bay of Plenty; Tauranga City; Tauranga South; and Welcome Bay. Tauranga is one of New Zealand's main centres for business, international trade, culture, fashion and horticultural science. The Port of Tauranga is New Zealand's largest port in terms of gross export tonnage and efficiency. Tauranga is one of New Zealand's fastest growing cities, with a 14 percent increase in population between the 2001 census and the 2006 census, and 11% between the 2006 census and the 2013 census. This rapid population growth has seen Tauranga overtake Dunedin and the Napier-Hastings urban areas to become New Zealand's fifth-largest city. The earliest known settlers were Māori who arrived at Tauranga in the Takitimu and the Mataatua waka in the 13th century. At 9 am on Friday 23 June 1826 Herald was the first European ship to enter Tauranga Harbour. The Revd. Henry Williams conducted a Christian service at Otamataha Pā. In December 1826 and again on March 1827 the Herald travelled to Tauranga from the Bay of Islands to obtain supplies of potatoes, pigs and flax. In 1835 a Church Missionary Society mission station was established at Tauranga by William Wade. Rev. Alfred N. Brown arrived at the CMS mission station in 1838. John Morgan also visited the mission in 1838. Europeans trading in flax were active in the Bay of Plenty during the 1830s; some were transient, others married local women and settled permanently. The first permanent non-Maori trader was James Farrow, who travelled to Tauranga in 1829, obtaining flax fibre for Australian merchants in exchange for muskets and gunpowder. Farrow acquired a land area of 2,000 square metres (1⁄2 acre) on 10 January 1838 at Otumoetai Pā from the chiefs Tupaea, Tangimoana and Te Omanu, the earliest authenticated land purchase in the Bay of Plenty. In 1840, a Catholic mission station was established. Bishop Pompallier was given land within the palisades of Otumoetai Pā for a church and a presbytery. The mission station closed in 1863 due to land wars in the Waikato district. The Tauranga Campaign took place in and around Tauranga from 21 January to 21 June 1864, during the New Zealand Wars. The Battle of Gate Pa is the best known. The battle of Gate Pā was an attack on the well fortified Pā and its Māori defenders on 29 April 1864 by British forces made up of approximately 300 men of the 43rd Regiment and a naval brigade. It was the single most devastating loss of life suffered by the British military in the whole of the New Zealand Wars. The British casualties were 31 dead including 10 officers and 80 wounded. The Māori defenders abandoned the Pā during the night with casualties estimated at 25 dead and an unknown number of wounded. Under the Local Government (Tauranga City Council) Order 2003, Tauranga became legally a city for a second time, from 1 March 2004. In August 2011, Tauranga received Ultra-Fast Broadband as part of the New Zealand Government's rollout. Tauranga is located around a large harbour that extends along the western Bay of Plenty, and is protected by Matakana Island and the extinct volcano of Mauao (Mount Maunganui). Ngamuwahine River is located 19 kilometres southwest of Tauranga. Situated along a faultline, Tauranga and the Bay of Plenty experience infrequent seismic activity, and there are a few volcanoes around the area (mainly dormant). The most notable of these are White Island and Mauao, nicknamed "The Mount" by locals. Tauranga is roughly the antipode of Jaén, Spain. Tauranga has an oceanic or maritime temperate climate. It can also be described as subtropical due to high summer humidity. During the summer months the population swells as holidaymakers descend on the city, especially along the popular white coastal surf beaches from Mount Maunganui to Papamoa. Tauranga surpassed Dunedin in 2008 as the sixth largest city in New Zealand by urban area, and the ninth largest city by Territorial Authority area. It has now also surpassed the Napier-Hastings area to become the fifth largest city. The city was growing at a rate of 1.5% in 2008. Tauranga is set to surpass Dunedin in Territorial Area by the next Census in 2018. In 1976, Tauranga was a medium-sized urban area, with a population of around 48,000, smaller than Napier or Invercargill. The completion of a harbour bridge in 1988 brought Tauranga and The Mount closer (they amalgamated in 1989) and promoted growth in both parts of the enlarged city. In 1996 Tauranga's population was 82,092 and by 2006 it had reached 103,635. In 2006, 17.4% of the population was aged 65 or over, compared to 12.3% nationally. The city hosts five major head offices – Port of Tauranga, Zespri International, Ballance Agri-Nutrients Ltd, Trustpower and Craigs Investment Partners (formerly, ABN AMRO Craigs). Tauranga is home to a large number of migrants, especially from the UK, attracted to the area by its climate and quality of life. Mount Maunganui Main Beach in winter, with 'Leisure Island' in the background. Council elections are held every three years and most recently in 2016. Much of the countryside surrounding Tauranga is horticultural land, used to grow a wide range of fresh produce for both domestic consumption and export. There are many kiwifruit and avocados orchards as well as other crops. The Port of Tauranga is New Zealand's largest export port, with brisk but seasonal shipping traffic. It is a regular stop for both container ships and luxury cruise liners. Picturesque sunrise over the Tauranga harbour. Tauranga's main shopping mall is Bayfair, in Mount Maunganui. Most of the city's shopping centres are located in the suburbs. They include Fraser Cove, Tauranga Crossing, Bethlehem Town Centre, Palm Beach Plaza, Fashion Island, Bayfair Shopping Centre, Bay Central and Greerton Village. A wide variety of faiths are practised, including Christianity, Islam, Buddhism, Hinduism, Sikhism, Taoism and Judaism. There are many denominations of Christianity including Pentecostal, Methodist, Presbyterian, Roman Catholic, Baptist and The Church of Jesus Christ of Latter-day Saints (LDS Church). The National Jazz Festival takes place in Tauranga every Easter. New Year celebrations at the Mount in Mount Maunganui are one of Tauranga's main events, bringing people from all around the country. In 2014 Tauranga City Council granted permission for an annual Sikh parade to celebrate Guru Gobind Singh's birthday. 2500 people took part in 2014, while in 2015, the number increased to 3500. Tauranga has a large stadium complex in the Bayfair suburb, Baypark Stadium, rebuilt in 2001 after a similar complex closed in 1995. It hosts Speedway events during summer and rugby matches in winter. Tauranga is also the home of football (soccer) club Tauranga City United who compete in the Lotto Sport Italia NRFL Division 2. Tauranga is the home to two rowing clubs – Tauranga Rowing Club in Memorial Park and Bay of Plenty Coast Rowing Club at the picturesque Wairoa River. Both clubs have had successful NZ representation over the years. Tauranga has an all weather outdoor athletics ground at Tauranga Domain. Greater Tauranga is a very popular lifestyle and tourism destination. It features many natural attractions and scenery ranging from popular beaches and harbour environments to lush bush-clad mountains with waterfalls and lakes. Cultural attractions include the Tauranga Art Gallery, which opened in October 2007 and showcases local, national and international exhibitions in a range of media. On the 17th Avenue, the "Historic Village on 17th", recreates a historic setting with original and replica buildings from early Tauranga housing arts and gift shops. Aviation interests are well served with the Classic Flyers Museum and the Gyrate Flying Club where you can experience flying a modern gyroplane; the "motorbike of the sky". Tauranga has many parks: one of the largest is Memorial Park, and others include, Yatton Park, Kulim Park, Fergusson Park and the large Tauranga Domain. The Te Puna Quarry Park has become a regional attraction, known for being converted from a disused quarry into a community park. Due to the temperate climate, outdoor activities are very popular, including golf, tramping (hiking), mountain biking and white water rafting. The Bay of Plenty coastline has miles of golden sandy beaches, and watersports are very popular, including swimming, surfing, fishing, diving, kayaking and kitesurfing. Tourists also enjoy dolphin-watching on specially run boat trips. The coastal suburb Papamoa and neighbouring town Mount Maunganui are some of the more affluent areas around Tauranga. The region's beaches attract swimmers, surfers, kayakers and kitesurfers throughout the year. Tauranga has many outlying islands and reefs that make it a notable tourist destination point for travelling scuba divers and marine enthusiasts. Extensive marine life diversity is available to scuba divers all year round. Water temperatures range from 12 degrees Celsius in winter to 22–24 degrees Celsius in summer. Tauranga houses two professional dive instructor training centres, training NAUI, PADI and SSI dive leader systems. Tauranga Hospital is the main public health hospital in the city. Grace Hospital is Tauranga's only private specialist surgical hospital. Powerco operates the local distribution network in the city, with electricity supplied from Transpower's national grid at three substations: Tauranga (Greerton), Kaitemako and Mount Maunganui (Matapihi). Natural gas arrived in Tauranga in 1982, following the completion of the high-pressure pipeline from the Maui pipeline near Te Awamutu to the city, now operated by First Gas. First Gas also operates the gas distribution network within the city. Tauranga City Council is currently responsible for approximately 530 km of roads, 700 km of footpaths, cycle ways and access ways. Tauranga City Council also has a bit of work under way with their Transportation and Roads strategy. Their aim for the future to change current travel behaviour from a focus on private cars to more sustainable modes such as buses, cycling and walking. Tauranga Airport is served by several airlines offering flights to Auckland, Wellington and Christchurch as well as some regional destinations within New Zealand. Sunair is based in Tauranga, operating a fleet of light aircraft. Sunair operates from Tauranga Airport to Gisborne, Claris, Whitanga, Motiti Island and North Shore. In addition Barrier Air operates from Tauranga to Claris with a Partenavia P68. Tauranga is located on the East Coast Main Trunk Railway. Main transportation in the city is provided by the BayBus, with twelve routes servicing the city's population. Bay Hopper buses depart the central stops in Tauranga's CBD, Mount Maunganui and Greerton half-hourly, with the routes to Mount Maunganui, Papamoa, Greerton and Ohauiti experiencing an increase in frequency during peak hours. The city is also a waypoint for bus travel between cities, with the Bay Hopper, and Intercity having a daily schedule. The organisations currently share two main campuses, but are planning a new central campus. Stage 1 is expected to be open in 2017, catering for 500 but with capacity for 700, which will cost $67.3 Million. Tauranga Boys' College, with about 1850 boys. Tauranga Girls' College, with over 1500 girls. Otumoetai College, with around 1900 students. Bethlehem College, a state integrated Christian school offering kindergarten and Year 1–13, with around 1500 students. Aquinas College a state integrated coeducational Catholic school founded in 2003 for Years 7–13, with around 800 students. Mount Maunganui College, a co-educational secondary school, with over 1500 students. Papamoa College, co-educational secondary school opened in 2011 for years 7 – 13. Te Wharekura o Mauao, a co-educational wharekura-ā-iwi total immersion Māori secondary school for Years 7–13, founded in 2010, with around 200 students. Te Kura Kaupapa Māori o Te Kura Kōkiri, a co-educational kura kaupapa Māori total immersion school for Years 1–13, founded in 2000, with around 140 students. ACG Tauranga, the city's first fully private school, offers pre-school to Year 12. There is also a Rudolf Steiner School in Welcome Bay, catering for birth to 12-year olds. Lynley Dodd - award-winning author and illustrator, principally known for her children's picture books featuring Hairy Maclary and his friends. Kathleen Hawkins – known as the "Pioneer Poet"
^ "100 Māori words every New Zealander should know – Māori Language Week | NZHistory, New Zealand history online". Nzhistory.net.nz. 1 August 1987. Retrieved 20 September 2015. ^ "Tauranga pronunciation: How to pronounce Tauranga in Māori, English". Forvo.com. 12 April 2008. Retrieved 20 September 2015. ^ "Local Government 1860 – present". Tauranga City Council. Retrieved 19 December 2008. ^ "Port of Tauranga Limited – New Zealand's largest and most efficient port – Port of Tauranga". Port-tauranga.co.nz. Retrieved 20 September 2015. ^ "Auckland drives 5% population growth | Radio New Zealand News". Radionz.co.nz. 15 October 2013. Retrieved 20 September 2015. ^ "Appendix IV - The Herald (W. Williams, Journal, 20 June 1826)". Williams, H. The Early Journals of Henry Williams, p. 479-494. 1961. Retrieved 14 February 2017. ^ Fitzgerald, Caroline (2011). Te Wiremu: Henry Williams – Early Years in the North. Huia Publishers, New Zealand. pp. 72–73. ISBN 978-1-86969-439-5. ^ "Koraurau (?-1828)". Tauranga Memories :Tauranga Local History. Retrieved 14 February 2017. ^ "Appendix IV - The Herald (W. Williams, Journal, 28 November 1826; H. Williams to C. M. S., 13 December 1826)". Williams, H. The Early Journals of Henry Williams, p. 479-494. 1961. Retrieved 14 February 2017. ^ "Appendix IV - The Herald (H. Williams, Journal, 26 March 1827; 7 April 1827)". Williams, H. The Early Journals of Henry Williams, p. 479-494. 1961. Retrieved 14 February 2017. ^ Rogers, Lawrence M. (1973). Te Wiremu: A Biography of Henry Williams. Pegasus Press. ^ Morgan, John. "The Church Missionary Gleaner, December 1841". Horrors Attending New Zealand Warfare. Adam Matthew Digital. Retrieved 9 October 2015. (Subscription required (help)). ^ "The Traders". Archived from the original on 20 October 2008. Retrieved 18 June 2009. ^ "Area Guide Tauranga – Introduction to the Bay of Plenty". Kiwitourism.com. 18 June 2006. Retrieved 20 September 2015. ^ Cowan, James (1922). "42, Gate Pa and Te Ranga". The New Zealand Wars: A History of the Maori Campaigns and the Pioneering Period, Vol. 1, 1845–1864. Wellington: RNZ Government Printer. ^ "Ultra fast broadband comes to Tauranga". Voxy.co.nz. 23 August 2011. Retrieved 20 September 2015. ^ "Northern New Zealand". NIWA. Retrieved 14 May 2014. ^ "Climate Data and Activities". NIWA Science. Retrieved 15 October 2013. ^ "2013 Census QuickStats about culture and identity – Birthplace and people born overseas". Statistics New Zealand. Retrieved 16 August 2014. ^ "Birthplace (detailed), for the census usually resident population count, 2001, 2006, and 2013 (RC, TA) – NZ.Stat". Statistics New Zealand. Retrieved 16 August 2014. ^ Geonames Database "Region information page", travelsradiate, 2010, accessed 2 January 2011. ^ "Ethnic group (total responses), for the census usually resident population count, 2001, 2006, and 2013 Censuses (RC, TA, AU)". Statistics New Zealand. ^ "Home". Ballance.co.nz. Retrieved 20 September 2015. ^ "New Zealand's leading provider of product handling solutions, on the wharf and beyond". C3. Retrieved 20 September 2015. ^ "One of New Zealand's largest investment advisory and management firms". Craigsip.com. Retrieved 22 February 2016. ^ "Leading Salt Manufacturer NZ". Dominion Salt. 20 June 2014. Retrieved 20 September 2015. ^ "Shuzi New Zealand – Shuzi New Zealand". Shuziqi.co.nz. Retrieved 20 September 2015. ^ "National Jazz Festival 2015 – Home". Jazz.org.nz. Retrieved 21 September 2015. ^ Keber, Ruth (5 January 2015). "Showcase of culture and colour in annual Sikh parade". The New Zealand Herald. ^ "Historic Village on 17th". Tourism Bay of Plenty. Retrieved 1 September 2014. ^ "Gyrate New Zealand | Fly a Gyro! | Flight Training & Sales". Gyrate.co.nz. Retrieved 21 September 2015. ^ "Walking Tracks, Gardens, Sculptures | Te Puna Quarry Park". Quarrypark.org.nz. Retrieved 21 September 2015. ^ "Our Networks". Powerco. Retrieved 15 October 2018. ^ "The New Zealand Gas Story". Gas Industry Company. December 2016. Retrieved 31 October 2018. ^ "Tertiary providers renew commitment to Bay's Education Partnership". The University of Waikato. Retrieved 4 September 2018. ^ "Tauranga to have CBD uni campus – The Bay's News First". SunLive. 26 January 2012. Retrieved 21 September 2015. ^ "Opinion: CBD transformation a major boost for Tauranga". Bay of Plenty Times. 10 July 2018. Retrieved 4 September 2018. ^ Diamond, Amy (10 April 2018). "School of the Week: Te Wharekura o Mauao has continued to grow since it opened". Bay of Plenty Times. Retrieved 4 September 2018. ^ Hunter, Zoe (12 December 2018). "School of the Week: ACG Tauranga". Bay of Plenty Times. Retrieved 4 September 2018. ^ "Kiwi leads Idol show by a neck". The Dominion Post. 10 September 2009. Retrieved 3 November 2009. ^ "Tauranga City Council > Building & Planning > Building > Building WOF > Independently Qualified Persons (IQP)". Tauranga.govt.nz. Retrieved 21 September 2015. ^ "Sister Cities - Overview (IQP)". www.nz.emb-japan.go.jp. Retrieved 2 January 2017. Wikimedia Commons has media related to Tauranga. Wikivoyage has a travel guide for Tauranga. This page was last edited on 3 April 2019, at 21:57 (UTC).